​Hey New Mexico FFA! My name is Annalisa Miller and I am honored to serve as your State President. My family ranches outside of the small town of Des Moines, New Mexico and I have an unexplainable passion for FFA. Through this organization, I have made many unforgettable memories, amazing friends, and had once-in-a-lifetime opportunities. I was once a shy seventh grader who did not speak unless spoken to. Through FFA, I learned that I have a voice and my voice matters. The world needs to hear agriculture's voice right now. Our legacy is a story of pride, work ethic, willingness to work together, and reaching out with helping hands. I believe New Mexico FFA members have the best voices to tell that story. I want to help you find your voice because your voice is important and can make a difference in the world. So what do you say New Mexico FFA? Are you ready for an exciting year? ​Howdy New Mexico FFA! My name is Lyle Logemann and I am incredibly honored to be serving as your 2018-2019 State Secretary! I hail from the small but mighty Elida FFA Chapter where I first found great love and admiration for this strong organization. I am currently attending Eastern New Mexico University Majoring in Agricultural Education. From the first moment I walked into my Ag classroom as an 8th grader I was encouraged to Live for a Challenge! Well, that is my goal as your Secretary. I hope to encourage each and every one of you to wake up every morning hungry for a challenge, and see how far our vast potential can take us! Agriculture is the world's first and most important industry; we are its leaders! We Live for a Challenge by keeping true to that inspiring task which is simply the work that must be done to preserve the best traditions of our national life. This year we will couple our love of Agriculture with Patriotism, and our determination with steadfast improvement! I cannot wait for the experiences to come. New Mexico FFA it’s time to live it up! Hey New Mexico FFA! My name is Brilie Dils and I’m from the Aztec FFA Chapter. Ever since my first year as a Greenhand, I’ve always had the goal of becoming a State Officer. I used to be shy and quite, but FFA has pushed me out of my comfort zone and is benefiting me greatly! Whether it’s a long drive on a judging trip or early morning chores for my show animals, I have become more responsible and more grateful for FFA and the agriculture industry. This is an amazing organization that gives members opportunities to become leaders, meet new people, and prepare themselves for their future. That is why I am so passionate about FFA and I am excited to show members around the state how great this organization is! I have made so many memories and can’t wait to make more! I am ready to serve you New Mexico FFA! ​What's up incredible members of New Mexico FFA! My name is Sydney Johnson and I am honored to serve as your District II President/State Vice President! Growing up FFA was never a big part of my life, as my family owns and manages a small mom and pop motel right outside the small town of Clayton, New Mexico. When I walked into the AG Classroom my very first day of my 8th grade year, little did I know my life would change forever. FFA has not only given me some of the greatest friends but has helped me create the best memories and has allowed me to experience once in a life time opportunities. I have found a place that I never would have thought I would fit in. I have learned hard work ethic, the importance of leadership, and service to others from my short time in FFA. My purpose as District II President/State Vice President is to help you find your place in FFA, just like I found mine. Each and every one of us has amazing potential and I can't wait to see each of you unlock it through FFA this year. My goal is to promote agriculture and I hope to give back to what this amazing organization has given me. I can't wait to meet all your smiling faces and I am excited to what to see this year has in store! Hello New Mexico FFA! My name is Cabel Cox and I am from the Corona FFA chapter. First of all, thank you for allowing me to serve you this year. I have grown up in agriculture, living and working on the NMSU research center in Corona where my father works. I have always had a strong belief in the importance of agriculture, not just to our world, but to each individual that works in it. I hope to continue in bring positive changes to our organization. I hope that through changes developed in this year, we can progress the organization further along this trail of greatness we are on. Although change can harbor new challenges, I believe that this quote that I leave you with from the acclaimed writer George Bernard Shaw helps to explain the importance of change. "Progress is impossible without change, and those who cannot change their minds cannot change anything." Hey, New Mexico FFA! My Name is Paden McDermid and I am from the Texico FFA Chapter. I have been an active member in FFA for the past five years, competing in most judging events, giving speeches, and showing animals. FFA was a great fit in my life because it combined the two things I love, agriculture and competition. I quickly developed a passion for this organization and the competitions it offered. Having served as a district officer, I have met many people and learned so much about leadership, the FFA, and people in general. I am excited for this opportunity to continue with my passion for this organization in a magnified way, and I can't wait to meet more new people and make an impact on New Mexico FFA. 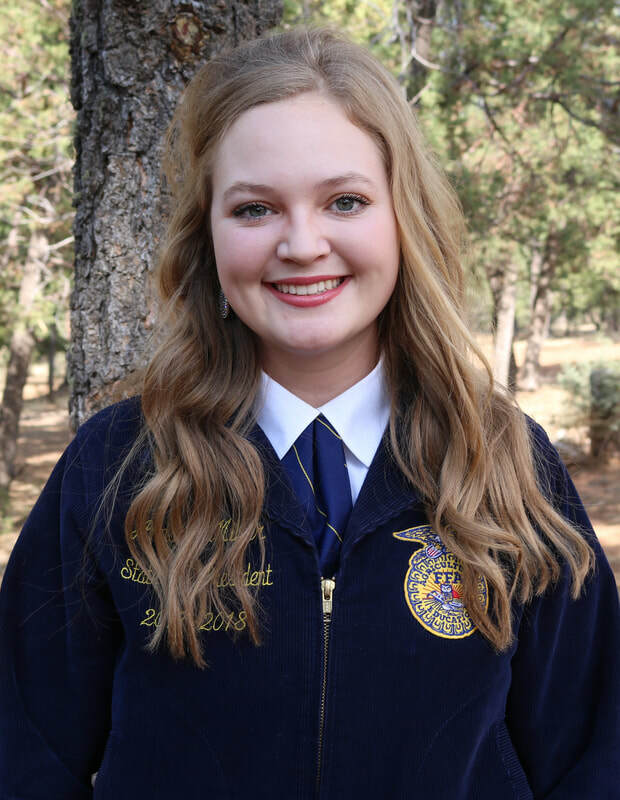 ​​Hey there, New Mexico FFA, Maegan Lemon here! FFA is such a huge part of my life. I found my FFA home in the Artesia High School ag shop, and the people that surrounded me there have change my life for the better. I know the impact and awesome change that FFA can inspire in its members and the community, and I'm so blessed to take part in that inspiring task. New Mexico FFA is such a driving force for good in the world of agriculture, and together we can continue to shape the future of agriculture. Hey New Mexico FFA! My name is Denny Atchley and I am truly honored to be serving as your District VI President/State Vice President. I am from the Las Cruces FFA Chapter and I am super excited to see what this next year has in store for New Mexico FFA. This organization has given me so many opportunities in my life that I never would have imagined being possible. I have made some of my best friends, competed against some of the toughest competition, and learned skills that will stay with me for the rest of my life. In our creed, we begin with the words, "I believe in the future of agriculture, with a faith born not of words but of deeds." It is you, the members of the FFA that cause that faith in the future of agriculture to burn so bright inside of myself, and the rest of the members of our great organization. It is you, the members, which make up our incredible institution, that have me and others like me convinced that the FFA is the single greatest youth organization in the world. Thank you New Mexico FFA for this incredible opportunity to serve you and New Mexico Agriculture.